Casio G-Shock GA-100-1A1ER to przede wszystkim wyjątkowy zegarek męski. Tworzywo, z którego wykonana jest koperta to stal nierdzewna i kauczuk, co świadczy o wysokiej jakości produktu natomiast tarcza jest wyposażona w wyświetlacz LCD. Zegarek wyposażony jest, między innymi, w chronograf (stoper) oraz alarm (budzik). Jeżeli chodzi o wodoszczelność, zegarek jest odporny do 200 metrów. Oznacza to iż jest zbudowany z myślą o nurkowaniu (z wyjątkiem nurkowania głębinowego). Do zegarka jest załączane oryginalne opakowanie oraz 2-letnia gwarancja od producenta. Happy with purchase.. delivery etc A1..
Watch is amazing and robust. Looks like the description and very happy with my purchase. The watch shop were amazing too. Would shop again. Arrived quickly. Well packaged and in perfect condition. Lovely watch, perfect for my job that means I need a watch that protects itself from damage and the elements. Quick delivery also! Top quality watch at a really good price, better than the high street for sure, I recommended to a friend and I ordered another on his behalf. My Husband commented on this watch in a well known shop and it was double the price of watch shop ! I purchased it for him as a suprise and he was delighted with the watch . I was really pleased with the speed of service and the communication . Ordered on the Saturday and picked up from my local GoldSmiths on Monday ! Will be most certainly using again , this time as a treat for myself !!! The watch itself is well made and after a little bit of reading fairly strait forward to set up. I was pleased to find a nice solid if slightly bulky watch that has both digital and analogue formats and a sturdy strap. I work in a law enforcement job and on the face of it this seemed like a good option, and reasonably priced too. Unfortunately theres one main draw back for me that means it wont be as suitable as I thought, the back light is a simple LED bulb that doesnt light up the digital elements of the watch, which makes it a lot less convenient especially when I want to quickly note down times on an early or late shift. Such a simple thing really and I wish I could see past it because in all other respects it is an excellent watch. Easy. The purchasing process was easy and simple and the delivery was on time. Absoulty fantastic service awesome deals definitely will purchase again would recommend to all. Multi functional watch for the gadget lover! Quite striking look in black. Bought as a gift for my husband who likes the G-Shock range. Chunky look and feel. A very serviceable everyday watch. Bought as a present. Looks great, excellent delivery service. Watch looks very stylish and just right for any male. My 14 year old will love it I’m sure. I bought this for my sons birthday. I was impressed with the speed of delivery and the watch was exactly as expected after reading previous reviews. My son is over the moon with it and it fits him well. The price was great and I would definitely order again through this company. Im very impressed! Very quick order process and delivered in a good time frame in which I needed the watch because my other one has broke. Good discounts and excellent deals or good watches. Excellent range of brands and products at competitive prices. Next day free delivery on my first order as well as discounts made me choose watchshop instead of amazon or any other retailer for my watch. Delivered on time, quality packaging, great product. Extremely satisfied. Brilliant watch,very please! Very fast dispatch and delivery !! I got this watch for my sons 14th birthday. Id previously bought a G Shock for myself from the watch shop and he loved it as much as I do. So knowing the great service first time I was happy to buy again from the same place. The delivery service is speedy and well handled, the watch itself is stunning, really chunky and military looking, just what my son was after, it makes a bold statement. Quality wise this thing looks bullet proof, just superb. Great price, great service!!!! Oversized ana-digi military cool G Shock,with perfect fit and finish.Its large watch,with a very easy to read analog display.The amber light illuminates the whole face.The digital displays are a deep purple which i find very atractive.The all black,stealth bezel is from the the military line from Casio.Has all the functions you would expect from a midlle priced G Shock.The resin band is soft and high quality.This is not a subtle watch,and its better suited for a wrist of at least 7.5 inch. 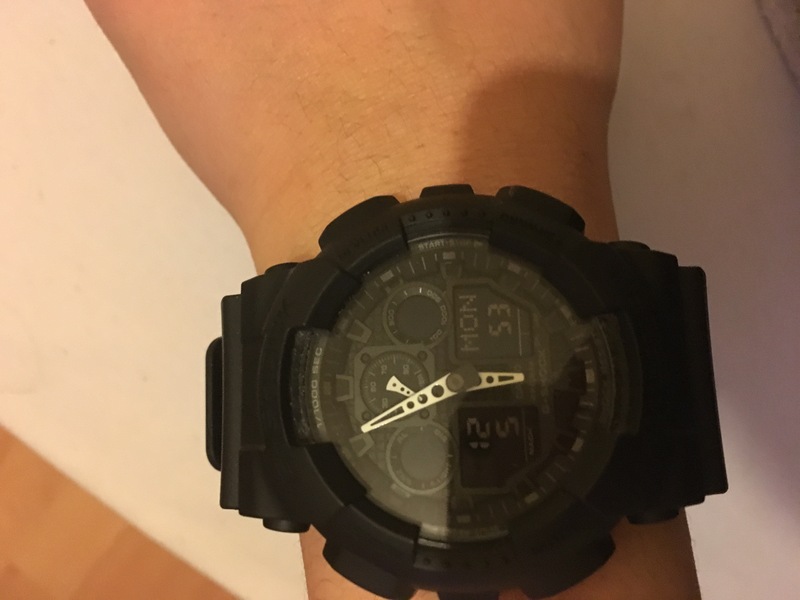 I was very disappointed with this watch, I bought it as a sports training watch - and although I didnt need much functionality, the functionality on this watch is very limited, its not really a serious watch its more like a toy. The watch face looks like there is a lot going on but actually more than 50% of the watch face is pretty meaningless, lots of silly dials that are supposed to look cool and tough but do either nothing at all or very close to nothing. A dial which measured seconds would be a good example of a useful feature that is not included but could have taken place of say the mach speed dial. The dials which do something remotely useful are the two small windows on the lower half of the face and these are largely hidden by the watch hands for half of the day. I like to train outside in the evening but the light on the watch is very poor and does not illuminate the watch face so if you are trying to find or set the timer for example then its very difficult. The timer bleeps only when it finishes not when it starts and so you have to check the watch to make sure youve pressed the button sufficiently again not easy in poorly lit places. The volume of the alarms, timer sounds etc is also quite quiet making it not very practical unless you are training in a library. Its probably a great watch if youre about 8 years old and have a good imagination. Long story short I love this watch. First off, it goes with literally anything I wear and I never have to second guess it when it comes to an outfit choice. The watch itself has got a nice big face with a matte black/rubbery finish that just looks so cool. The LED light is bright orange which happens to be my favourite colour, its bright enough to be able to see the time when its dark, but does not blind me at 3:00 AM when I wake up in a panic that Im late for work. Its not as bulky as I expected like some mens watches can be, and it came as a very nice surprise. I have skinny wrists and was skeptical about it for that reason, but I think its looks incredible. What I also like about this watch is its resistance. I work with heavy tools/machinery and I am always having cement mixers or steel props bash against my watch. And it is still just as good as the day it arrived! It was really easy to set up, it only took me about 10 minutes in total after having a flick through the manual to set the alarm to the time I want, set the time and date, city location etc. I wouldnt be without my watch now. And I dont know why I didnt buy this sooner. 10/10 would recommend to anyone who is second guessing buying this watch. Great watch at a great price! Hello just receive it ! Its Great more than you see in the picture! Received within 48 hours of placing order and the watch is a great item which was a gift for my son who wanted something very rugged, durable and waterproof for work. The watch is very easy to set up and looks like its built to last. The display is easy to read and operate. Despite its chunky look its relatively light in weight and doesnt feel like its on your wrist when being worn. Very pleased with the service from watchshop and the choice and value this site offers you. Bought this as a birthday gift for my daughter to give to her daddy! He loves it! 4 days languid waiting, and then I received a parcel from Watchshop. Opening the coveted box - I saw these stunning watches !!! 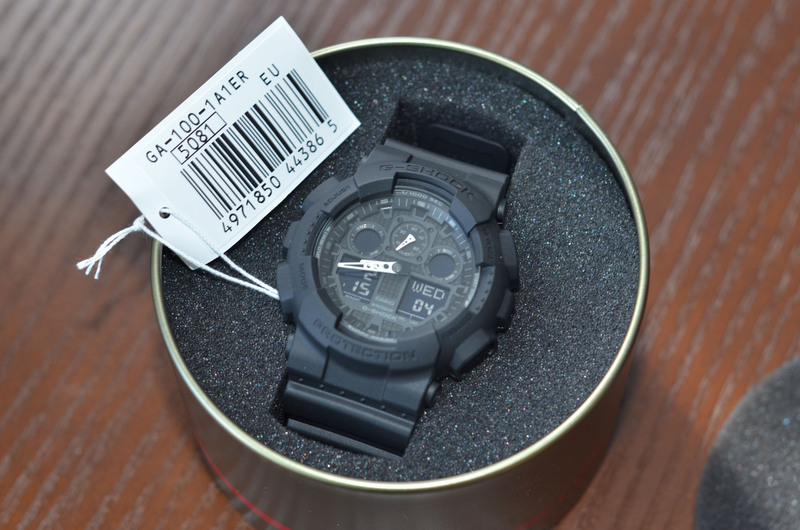 It was CASIO, model of GA-100-1A1ER of the family G-SHOCK in a beautiful matt black. The product is pleased with perfect build quality and materials used. Rubber strap perfectly pleasant sitting on the arm, and a large dial shows from under the sleeve always attracts glances. These watches are a great accessory for the modern man. Thank you very much for a great device, and fast delivery! Watshop you are the BEST! Great watch, receiver loved it! Brought for my son great watch, durable and well made. As always gshock serving great watch which make a job very well. All condition -proof.Tough and reliable. Love black colour watches and thats is great replacement for expensive one You want to use everyday everywhere. Very well packaged. Lovely solid lightweight watch with excellent user functionality. Black with backlight is sleek and subtle. Very classy strap and very comfortable on the wrist. Nice watch, nice fit and good service from the workshop. Hands on watch are not glow in the dark and display is very dull - the light works OK but not as good as it should/could be. I had looked at reviews so already knew this but was still what I was looking for so didnt disappoint.good looking watch with good features. I thought the G-shock is a excellent watch. Its very comfortable to wear and its practice when playing sports. 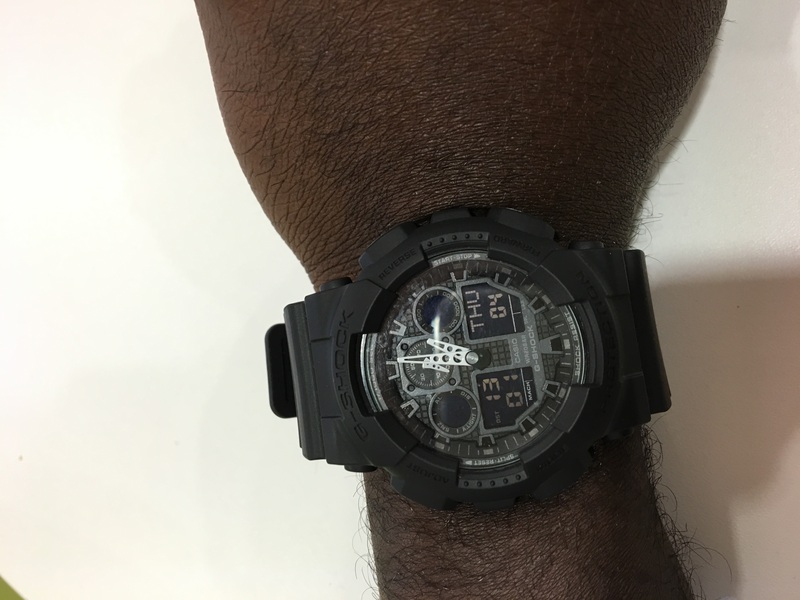 I needed a watch which can be durable, due to my work and I can very happily say that the G-shock is the perfect watch for that. The colour is great. A very simple black. The only downside I had was setting up the watch. Its not like normal watches. Theres a lot of technical ways to set up the watch which I found a little tricky. But overall I think the watch is excellent. Its practical and excellent if you play sports. The Watch is brilliant, It came in perfect condition and was a great birthday present, the person I got it for was well happy and the delivery was super quick. Excellent watch. Love the black mono look. I got this for my boyfriend he loves it, he wanted something to with stand his working environment but also stand smart at the same time. Very satisfied throughout. Great product at a good price. top watch great quality ! It is a really good watch the dual time feature is really helpful especially if you are in a hurry its easier to read the digital time, also it has so many features you can set the time to anywhere in the world and it has a timer and many other features, its so worth the money and Id reccomend it to anyone. Great buy! Great Product, Fast dispatch. I will recommend !!!!!! A good watch, with good features at a great price, should be perfect for anyone who is going to need a tough watch. Lovely, quality watch. Experienced great service from the watch shop and fast delivery. Great watch, looks even better in person. Love the way it has different time zones but also how it changes. Great price for a great product. Very good company to purchase a watch from! Very quick delivery. If you like a watch on here click buy and it will be with you in a few day! A cool matt black with a stealthy look. Very comfortable on the wrist and for those who like a big watch, this is a meaty looking one. All the gadgets you need - stopwatch, 5 alarms, waterproof to 200m and shockkk resistant. A couple of things Im dissapointed by are the backlight which isnt very bright and the digital display, also very dim! But apart from that a lovely watch. I was very impressed with the watch and it was delivered in excellent time. I would recommend to anyone this website for buying watches. 2nd time I have bought this watch. Not because my old one broke but because my 1st was that good I had to double up! I have owned this watch for over a year now and still looks brand new. No scratches or damage and I use it as my daily. Looks good. Not used yet as xmas present. Perfect, durable watch, just what I needed for my son in the Forces. Nice product at a great price. Bought for my son, hes really happy with it. I have ordered this product as a christmas present for my Godson and we all loved it. Excellent choice. Definetely will buy more products. Merry christmas all. 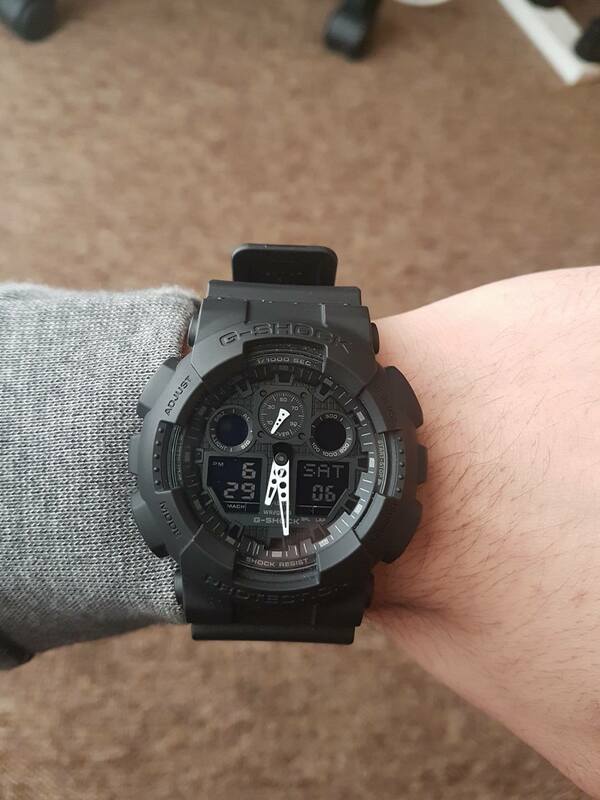 Bought as a gift for my boyfriend who already has a couple of g shocks in his collection. Amazing quality for the price, the watch and strap have a soft nice matt finish. Was impressed by the detail on the face and the amount of functions this watch has. I was concerned about the brightness of the light after reading some reviews but it was much better than I expected and completely readable in the dark. Although this is a watch designed for active wear its also smart enough to wear in everyday use. Really happy with my choice. Brilliant service and great product. The watch arrived at my house quickly and i am very pleased with the outcome. Bought as a gift very nice in all black. Have one myself, have had it for six years now and its still going strong. Brilliant watch, bought it for my dad for his birthday and now my brother. The quality is amazing for the price and I would totally recommend it. Good watch, used for work, seems tough. I am using this for work and it has already taken a beating and is still working well. Exactly what my partner wanted simple yet stylish looking. G Shock came well packaged and in no time at all. I couldnt ask for a better service unless I wanted them to ware in for me as well. This is a very good price watch . Looks very good . 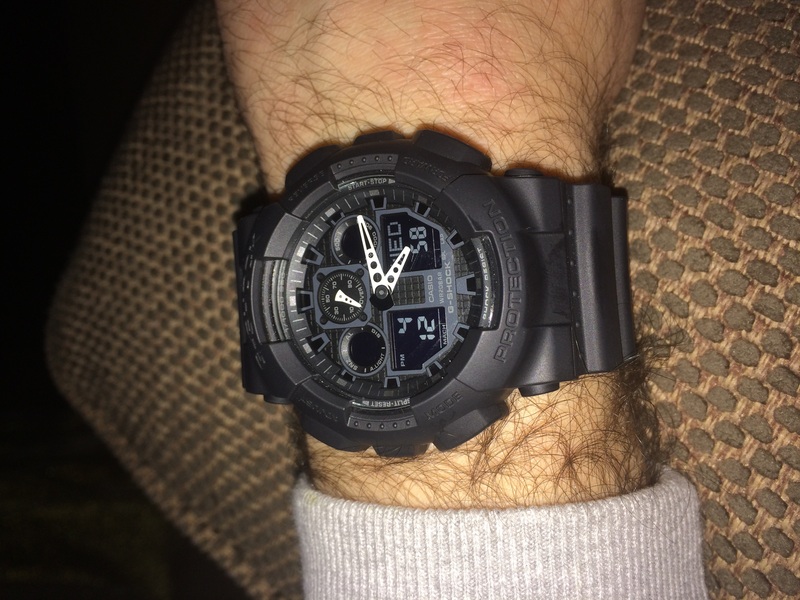 The G Shock is top quality and the the delivery time was just over 24 hours. Received this watch as a gift from family. It was a great choice love the design and its functions. Its simple, yet very stylish look makes it versatile for both formal and informal wear. The functions are easy to use and set up, would definitely recommend to those who are looking for a watch with multiple features. Its a strong, tough and durable watch that will last long. Overall, a very Good Looking Watch. Great every day watch, its got a lot of settings to play qith if you want to. Or, you can just use it to tell the time, day and date like me. Very happy with my purchase. Great value for money. Wish it was for me instead of my son!! Mistake purchase. Didnt need stopwatch, countdown timer, time around the world or ability to switch on light by raising my arm. All I wanted, apart from the right time, was the multi-alarm capability as a reminder of when to take medication an alternative multi-alarm watch seemed too small. No instructions included - four pages of small print had to be downloaded from internet. Invitation to review has prompted me to try again to set right time and alarms. But controls are awkward and digital display not bright enough. I have yet to move the hands to show GMT. On the plus side, if in desperation I threw the watch against a wall it would probably be unharmed. Brilliant watch. Good looking, easy to use and comfortable fit. 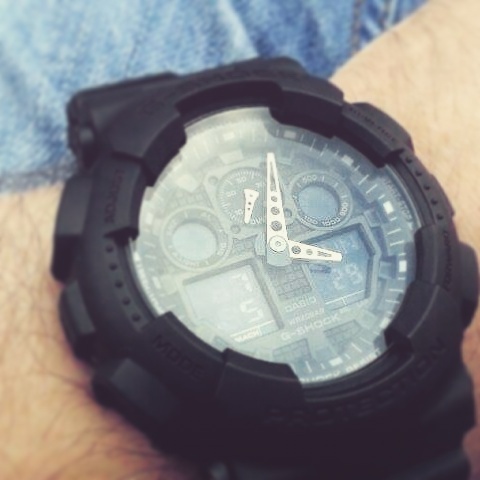 I always buy g shock and this is the best one yet! The watch is a great size, really way to use. Very stylish! My husband is very pleased with his watch and loves the style. The strap is good and all the features are excellent. Easy to set up and great the way you set it to your whereabouts and it automatically sets time. It was z good price. Only thing not so good is the other dials around the time are quite difficult to see and the light doesnt make any difference, only any good for night. Casio g-shock most amazing watches always recommend to all. Only downside is that I requested watch to be set to UK london time so I could use it asap but unfortunately I had to set everything myself. The gshock is an epic series of watches and never fail to impress me. I went for this one as its very dark and stealthy looking. Love it! The watch looks good and the five different alarms, time zone differences are very good attributes of the piece including other such as the countdown element of it. The only criticism that I have would be the sound of the alarm is not loud enough. I like the fit of the item and the matte finish to it. I like how the color could easily match any outfit I plan to wear and it really stands out. The watch itself is excellent fits perfectly and I have quite large wrists. I chose this watch as I work outside day and night and needed a sturdy reliable watch that could handle a bit of a beating and its been great. Very happy with the watch and if it ever does break I know what I will be getting again! The watch arrived in excellent time and is exactly as described. Im very happy with it. Excellent service. Love the watch. Great price. I like this watch, very practical, tough and exactly as what I expeceted when buying it. I dont have to take it off anytime as it can withstand any conditions. The price itself is a perfect deal!! Large and chunky face to this watch and a generous sized strap, I am over 6 4 and I find that some straps I am right on the limit when wearing them, but not this strap, i have al least another two holes to use after the ones I am using. The matt Black Plastic/Rubber case strap looks smart and can be worn with anything in my opinion, Cant say that I have used the stopwatch, Alarm, countdown features yet, but the use of these looks pretty straightforward, The analogue hands on the watch are a bright silver/white colour giving excellent contrast in any light, so easy to see the time at any time of day, unless in complete darkness, then you can use the light. My only grumble would be the LED readouts, these can only really be seen in good lighting conditions, and the light doesnt really help you see these otherwise. Really like the watch, quite big and stealthy. The only slight downside is the hands are not glow in the dark and the light doesnt light the LCD screen when dark, this is not a problem for me, but could annoy others! Bargain for the price I paid. Ordered 1pm, arrived next day, very good service. Excellent watch, definitely worth the price. Great watch, superb quality, very accurate. I use this watch for work and Im not extra careful, sometimes I hit things, like table corners, but I cant see any signs of damage or any scratches on the glass. great watch, had for a few weeks and is seeming very robust, is comfortable and is nicely chunky. I purchased this watch as a requirement for my military training. At first I was extremely unsure until I ordered it. The watch is brilliant. It is a perfect fit for all sizes. Very clean, and has a decent later id protection. It is great with keeping in time, the extra features including the alarm and many others are perfect! I would recommend it to anyone. 110% worth every pennie. Nice sturdy watch which should last. Very easy to setup. Sleek sports watch that can be worn on any occasion. I chose this watch as due to the nature of my job I need a tough, robust watch that can stand knocks.The watch face is recessed so scratches are avoided.The strap is quite wide and strong with 2 pins.I would recommend this watch to anyone. I like big watches, and this baby is chunky. It undoubtedly has a masculine feel about it, not to say that it couldnt be worn by a female, but this is a watch that says Ill have a full pint not a half, Ill have the double burger. The watch looks tactical the matte black finish, the double tang strap, the white on black display - it all adds up to a watch that looks like it wants to see action. The city/time zone feature is great just select your city and watch the hands whir round to the correct time, its actually pretty fun. As a serving police officer, I needed a watch that was accurate and tough enough to withstand punishment. I can confirm that it is as durable as it looks as, on only the second day of wearing it, it got a miscreants boot making a pretty solid connection with it...not a mark on it. Also, it is very light, which is surprising given the aforementioned size - another bonus for me when I have to leg it after someone. Ive had a few colleagues ask me about this watch and where I got it, although Im reactant to tell them as I dont want everyone to have one...though maybe I should be nice. Great product, thoroughly recommended. Fantastic watch for the price. I have been diving, kayaking, jet skiing and water sports and it is fine. Stays on your wrist just fine and is very comfortable to wear all the time. Bought this watch for my son.Excellent watch and looks great on aswell.Well made and looks very stylish too.He even wears this watch to go swimming in.Cant fault this watch in any shape or form,would recommended this watch to anyone. Extremely pleased with my new watch fits perfectly and looks great, features as said and love the auto light on. If there is anything negative it would be the slightly thin feel to the strap, it just feels the watch deserves a more heavy duty strap. Great watch made even better after discount. Delivered on time and great service. I absolutely love this watch! It is comfortable, and looks really good. My only problem is that its hard to read some of the digital displays at times. Its also perfect for anyone who has a physical job like me as it is seems to be indestructible! EXCELLENT SERVICE AND GREAT WATCH. Liked the range of watches at this shop, after reading reading reviews, picked this one for work, to not to damage my other watch and not to be afraid to scratch metal shafts and Im working with, as this watch has a soft case. Timer is useful to track the spawn time for Roshan and runes, and stopwatch is handy and easy to use. Very fast and efficient service.just the sort of watch I need for my job. Great, practical everyday watch. Delivery was fast, even with watch strap adjustments that I had requested. Definitely would recommend this watch. Speedy delivery and a great watch. Had to get used to the analogue display being there and the toggle between seeing the date and the time, but all in all a great watch! I bought this watch for my partner he loves it. I thing G-Shock is the best watch you can get because of all the fuctions it has. Bought as a gift and recipient extremely pleased as the features on the watch were exactly what he needed and wanted . Delivery was excellent - within 24 hrs of purchasing. Securely packaged.Wouldnt hesitate to order from here again. Ordered watch one day, delivered the next. Fantastic service. Would highly recommend. Great watch. Looks exactly how it is advertised and does everything I need. This watch looks totally rugged, and yet is super lightweight. The hour and minute hands are very clear to see and the contrasting white hands on black background looks good too. The hands arent self illuminating, you use a button on the watch to cast a dull yellow glow over the face at night, which looks ok if a bit old fashioned. The digital functions are great during the day, but anything other than perfect daylight renders all digital functions useless - because you cant see them. This is a pain. There should be a way for the background to be lit in such a way that these functions are usable. I was amazed by the watch and it was looking absolutely stunning for a present and to be honest price wasnt that high in watch shop which makes me more addictive.i feel that watch shop is one of the great place to buy watches for any occasion and I already bought four watches from them as their services is excellent. They have delivered on the dot. I feel that I can recommended highly to my friends and family rather than going some other high street retailer. Very very pleased with looks and function! Very nice watch i brought the watch for work as it is a tough watch so far so good also fast delivery time. This watch is fantastic. It fits perfectly and the display is good. It is easy to use once you know how to. This watch is just what I was after and j came the next day. I strongly recommend this watch. Very good watch would recommend to anyone, also very comfortable. This watch delivers what is advertised on the website. Poor aspects i if you wear a shirt esp with cufflinks this watch is NOT for you and ii to set the time ignore the manual - its more confusing than illuminating. Go to the WatchShop video on You Tube. I would add that I also had to view a non-WatchShop video on You Tube to correct the time: you may want to think about updating or adding a further video WatchShop. I bought this as a second watch to wear when training and when out running around. Its so good Im wearing it all the time. Looks good and works well. Great everyday watch, that wont look out of place on a night out. Great features & excellent battery life. Rugged construction. Great item, very easy to use and despite its look and size it is very light weight. Product was delivered extremely quickly with excellent customer service. I would definitely recommend this product. The date and time digital display is simple, easy to set up and change settings, great to see the use of digital display for the day and date. Excellent look and fit - very modern and durable. Best watch Ive ever bought. The watch is great and only took two days to arrive. Lovely purchase, really nice watch my son is very pleased with it. Delivery was super fast as well and I was kept informed all the way through the process. Purchased this watch as i needed one for joining the Navy, Its my first proper watch and it is Fantastic! Feels really durable and is a really good fit also, This watch is easy to set up as you can choose from all the different time zones in the world and the watch will set automatically, It is also very comfortable and does not feel heavy or too bulky, the glass on the watch is really durable also, i have accidentally impacted it a few times quite hard and there isnt a mark on it! would really recommend this watch if you plan on using a it for work or sports activities as it is really durable. Love it. G-Shock is the ultimate tough watch. It was born from a developers dream of creating a watch that never breaks. This watch chimes in with everything. If your life is an adventure, active, casual, each lifestyle. Also, I think this watch can wear women too, so it’s unisex. I bought this watch for my boyfriend, I have raised money for a long time, and I am not pity about it. This is a good present and a perfect thing for long time using. In life watch looks in hundred times better. One of the tendencies of the 2010th year - increase in caliber. And it concerns not only the diameter of the watch. The thong became wider. It is good, g-shock has to be much. One more good innovation - GA-100 have no set of the shouting details of the unclear appointment. They have quite simple and clear form.It is pleasant to me that on the watch, there is only black color, no red or no white inscriptions. At the expense of it, the model looks simply and interestingly. Black hours are called as GA-100-1A1DR. Coming back to the form. I liked white shooters with a peculiar perforation, besides the main there is also an additional small arrow. Pounds from it a little, but it is beautiful. Quartz watches as the producer declares, the charge lasts for two years of work. I cant check this information yet. But I think hey will work more than two years. As well as any other G-shock, GA-100 are protected from blows, falling, immersions here - on depth to 200 meters. You can use them in the sports hall, on travel if you lead active lifestyle or works. Active image of work. It is fine told. Arrows and the display are closed by mineral glass, the case from plastic, it is interesting that at the black model it as if rubberized. Also, there is a protection against magnets of all colors conforms to a certain standard of the International organization for standardization. The top button in the right side includes illumination. It here unusual, light-emitting diode. It is pleasant to me more when the dial is highlighted exactly. Here as if a lonely lamp in the night. There is an opportunity to establish automatic activation of illumination at the turn of a wrist, is checked, works very well. An interesting feature is an existence of an alarm clock, it is possible to establish five signals for various events. The sound not loud, this alarm clock me didnt wake in the morning. But during the day can remind of something quite. The appointed symbol is displayed on the top left display, in the same place - the indicator of the included automatic illumination, the activated signal which is distributed in the beginning each hour. I liked the face of this model the increased caliber simplified. It is very good that it is hours with shooters, and the price pleases even more - to buy GA-100 as in your shop. For daily carrying or for use in the sports hall, or for each important event - the good option. The only thing that is not really pleases even more - to buy GA-100 as in your shop. For daily carrying or for use in the sports hall, or for each important event - good option. The only thing that is not really pleasant, it is illumination. Thought it is possible to reconcile to such trifle. requested by hubby for a birthday present. He seems very pleased with it. strap is large enough for his wrist others have failed on this point in past and he states he keeps accurate time to the second. Considering he is a grumpy so and so about his birthday, he seems very happy with this watch. Bought two of these for two of my brothers as they both requested it for a Christmas present, and are both loving the watch! Great watch and a fantastic price. Third g-shock watch Ive bought. Basically indestructible, have worn these daily for work caught them on stainless steel work tops and not even dented them, dont expect any different from this watch. Looks great and fits well, the size may be a problem for sleeves and shirts etc... One to bear in mind cant fasten cuffs on some shirts and one of my jackets is a little tight when wearing this watch, but I like the watch more than the jacket! Really pleased with my purchase exactly as described on the web page. This watch is one of the few affordable mens watches that can be worn casual or with a business suit. Easy to tell tell time and set up was pretty simple. Delivery service brilliant I was kept informed all the way by Watchshop and the Postal Service, from order to collection in Goldsmiths. Well done team Watchshop I would definitely order another watch from you in the future, and have already recommended you to a number of friends and colleagues not something I normally do. Perfect service! Price went down same day and I was given a refund. My partner got me a watch too from you but Ive not received a returns bag I was promised due to the watch being too big and the second link not coming out. Good service, product as prescribed, fast delivery, have recommended watch shop to friends and family. This watch is perfect for my everyday use. I wanted something stylish and rugged but not over the top with features. I use this for work, at the gym, mountain biking and just everyday use. It looks slick with the black and fits great. Attractive, durable, sturdy watch. Well suited gift for my partner who does manual work also looks great. A nice watch. I like Casio and have a pro trek which is brilliant. This is very light on the wrist and looks really good. However as others have said it is hard to read the lcd displays in certain light. Not a problem for me as I bought it for the way it looks more than its functionality. For that I have my pro trek. 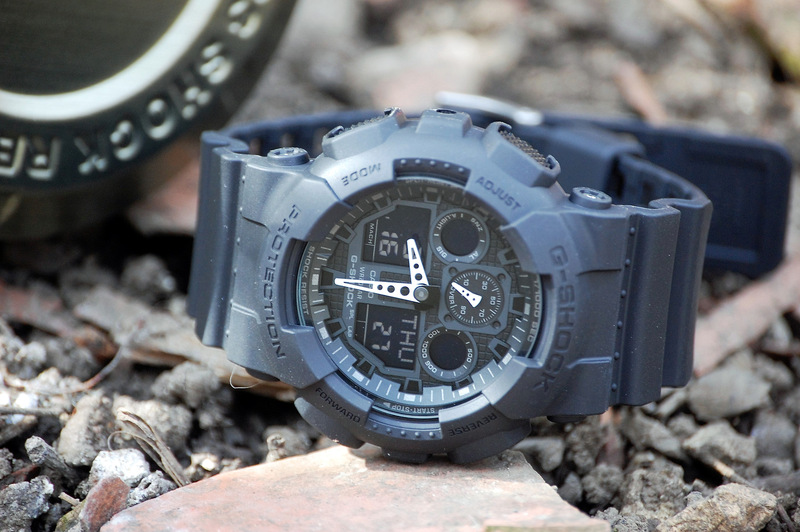 Tough, light and practical G shock watch. Matt black makes it look stylish & expensive. Lots of features & easy enough to set up. Bought as a Christmas present for my husband who loves it!! Great looking watch. Set up was a little difficult but worked it out in the end. We bought this watch for our son who works in building trade, a great buy. Rugged and robust. He is able to work with the knowledge that it will work no matter how hard the work is. Excellent watch, bought for my 13 year old son. Very well made and a sturdy tough finish. Lots of features that are all easy to use and clear time display, this should hopefully help my son arrive on time! thats if he remembers to actually wear the watch! Great watch, perfect present for my husband, exactly what hes been looking for. Comfortable, casual and cool! Like it!! Looks good to me great price and brilliant delivery service I just hope I got the gift right! Fabulous watch with some very clever features. I purchased this as a surprise present for my partner who was absolutely amazed to get so much watch for a very reasonable price. It was everything and more than what he expected. Very handsome watch. Very good and nice watch with functions I nedd for a good price. Very happy that I get them even shipping service was great. Wish you a many customers and hope youre busy at this time before Christmas..! Simply stunning watch, clear display and easy to operate buttons. Takes a bit of time to set time correctly etc but just take getting used to. Bought as a Christmas present for my son. Very happy with the watch, exactly what we were looking for and as is described. Website easy to use and the delivery was very quick. Got this wee cracker for work, but it looks so good I wear it all the TIME. I have bought this watch for my sons birthday. Looks nice,comes in nice packaging and was fast delivery.. Instructions take a bit of time, but you can always do a search on YouTube to get instructions on How To do something. Great watch and great service from watch shop - I work nights so the well discussed issue of seeing the time is no problem at all - the orange light is all you need and is really cool as well. I was a little bit hesitant about ordering a watch over the internet as you read lots of reviews about them arriving late and being fake. So I took the plunge after lots of positive reviews about the Watchshop. I was amazed at how fast the watch arrived and I can safely say that i am a total convert. I had no need to be concerned as the watch is perfect. It came well packaged as was exactly as described. I would and will highly recommend the Watchshop to all my friends and family. Thank you very much. A fantastic watch at a very competitive price. Great service, easy to use website and next day delivery! A lovely Casio watch. Nice big face and easy to read. Fantastic product with speedy delivery and excellent delivery communication. Item came well packed and I was very impressed with price and service. Thank you I will be a returning customer. Amazing watch, as always G-Shock watches are robust and well made. Watch was bought for sons 16th birthday and he is joining the Royal Navy so I wanted a tough watch and one with world time for when he is at sea. This watch has everything and the auto light by tilting your wrist is a brilliant touch. 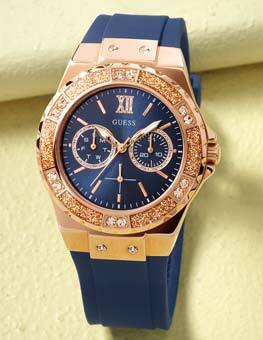 A for this watch and watchshop for great value and quick delivery. Great watch, bought it to have something strong for work, so far its great, seems to handle the knocks and I dont worry about it. 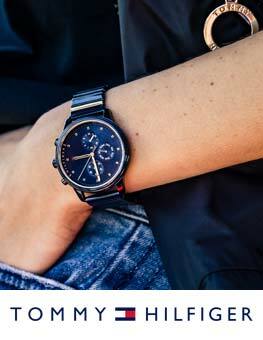 Fantastic, practical everyday watch that oozes quality and good looks. Rugged in style and build to withstand the ups and downs of daily use. I love the LED light in orange, looks great in the dark. The all matt finish on the watch also looks great. The strap is comfortable with many options to adjust. 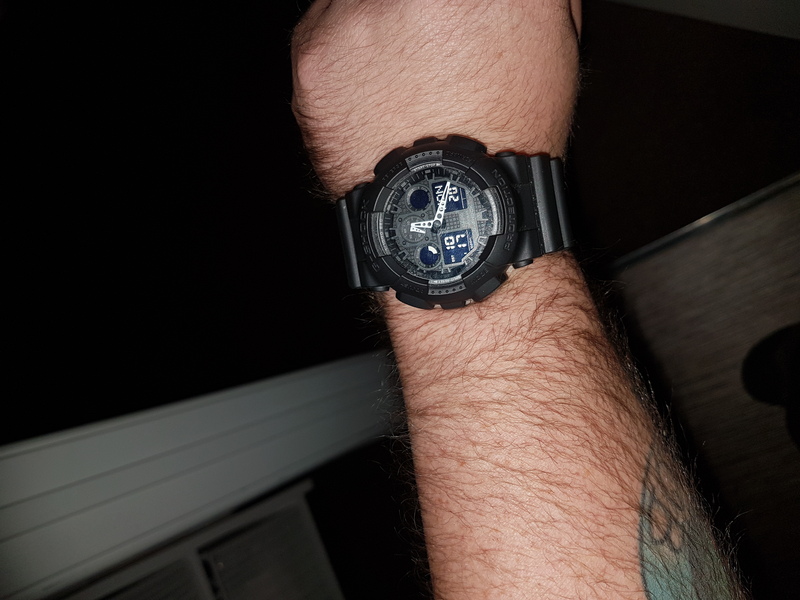 Very pleased brought for my husbands birthday, was a bit unsure first as the size of the watch is a bit larger than my husband has normally had in the G-shock range but I havent been disappointed its just right. Overall very pleased great price and most important my husband loves it. Excellent watch with a lot of useful features. Very stylish and quite sporty. I particularly like the function of selecting different time zones by just clicking a button, quite handy for a person who travels a lot. The only con would be that the light is not powerful enough to actually see the digital readings on it. 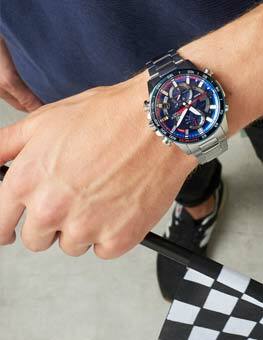 Nevertheless this is a very stylish, sporty and casual watch for your everyday use. A big thank you to watchshop, delivery was very fast and always reliable. The only place I trust to buy quality watches. Its a really good watch. Its strong, looks good and functions well. Very happy with it. 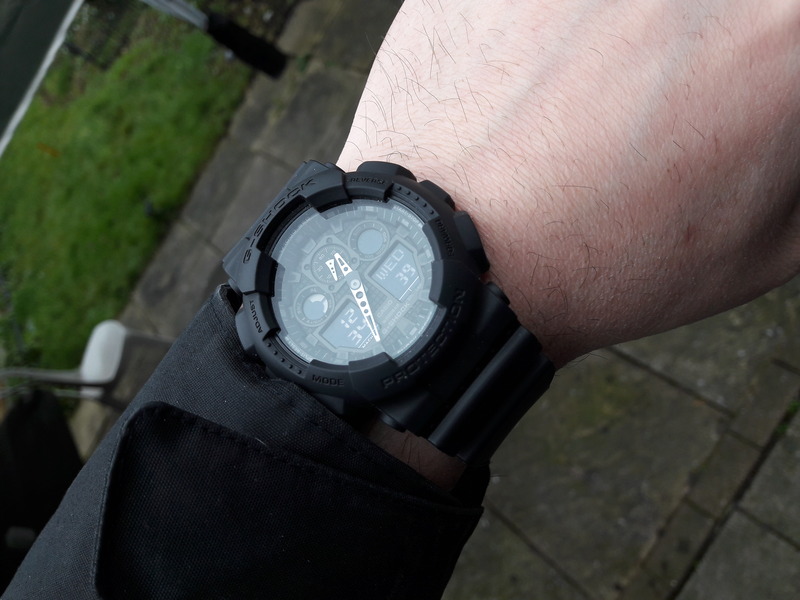 My first G-Shock and have to give it a 5, feels really good on the wrist nice and light but really strong, display is clear and using it is so simple. Nice watch, not too large so quite comfortable to wear. Plenty of functionality, multiple alarms, stopwatch, countdown timer and world time to play with. Nice looking watch to boot! Cant really review the watch. Its what I wanted and tells the time but delivery was excellent. I ordered in the afternoon and it arrived before 9am the following morning. Plenty of delivery updates too had I wanted to track my order. Great watch. Strong, simple, easy to use. Looks great in black with the white clock hands. Great for everyday use. Only problem is that the light is poor and Casio should replace the light with glow system they use on some of there other watches. Brilliant watch, everything I expected, looks great, easy to set it up, excellent for every day use. Safe to say I struggle to take it off. can never trust Docs time machine. Purchased the G-shock on 21st Oct 2015 Looks even better back in 1985..... Uber fast delivery and has taken a beating already from the dolorean-dmc. Bought as a gift for my brother - when he opened it he was blown away by the size and quality of the watch, full of features and very easy to set up. Length of strap is excellent to accommodate various wrist sizes and the watch looks the part for outdoor activities. Excellent website and service, will recommend and use again in the future. Great watch and service, watch is just what I wanted, solid and rugged for the outdoors. Service was great, ordered late Saturday night and arrived Monday morning. Whats not to like, cheap, Good quality watches at your door without having to leave your house! Great watch, absolutely bomb-proof and love the black out look. Great addition to watch collection and for an every day, tough wearing watch. Excellent watch for money. Extremely robust and loads of features. Will no doubt end up buying another. I work offshore in a wet and dirty environment and wanted a watch that was tough and could be washed. Very quick and reliable delivery as it arrived in time, product was nicely packaged and no damage was seen, the watch is very comfortable and reliable and surprised me with the many different features, very recommended. The watch looks substantial, well built and well designed. The all black version means its smart as well as being practical for all occasions meaning you can use it for work and sport. Very easy to use and very clever. Excellent quality, super fast delivery, would buy again! Great watch, does everything I want. Good rugged watch, do you need it if you are living a fairly active outdoorsie life, probably not. Is there a cheaper better fitting, stylish option? Yes. It is very GREAT! Beautiful Black/Dark Grey Colour! Perfect Style,Size. clear information! Totally 10/10! Im recommend to you should buy this product when you go to school or college or work. Fabulous helpful staff - super fast delivery - great product and fantastic value! Nice looking watch, looks stunning in the all black version. Nice solid, rugged design that fits and sits well on your wrist. Nice sized face that displays everything perfectly. It looks even better in real life, the pictures dont do it justice. A great thing for me as I travel overseas frequently was how easy it was to change between timezones without any difficulty takes 5 seconds. As is usual with the Casio range, comes with an instruction manual the size of a small book! I will read it one day. Brought this here for nearly £30 cheaper than I could find anywhere else.....grab a bargain now. This watch is fantastic for its price. The watchshop is a great place to buy any watch from. I highly recommend the watchshop. Very nice watch, just what I wanted, and very good service from watchshop would make another purchase in the future. This was the first G shock I purchased and I instantly fell in love with it. It was the perfect size and after reading previous reviews I realised that this is what i wanted. The colour of this team just compliments it and it makes the G shock watch just seem more stylish. If I was to say one bad thing about it, it would be the fact that the light is extremely small but that problem is minimal because of the fact that there are so many positives from the watch. Bought this watch to send to my brother back home as an advance Christmas gift. This is the second G-Shock that I bought here in Watchshop. This looks very attractive. Its quite massive well, the normal G-Shock size. Bought this on sale as well. I am very happy with my purchase because in all other shops they are selling this for a normal price. I think its very popular as Ive seen this model/style in a lot of shops so I am very happy with it. If you want simple G-Shock but attractive, this watch is for you! Delivery is also superb! Robust, stylish and non offensive. Great functionality for my needs. Feels good on the wrist too. Not too big that it wont fit under a sleeve although it does protrude somewhat. I love it! This watch is chunky but very light weight but it still looks good on my wrist and im a girl and i love my g shock watches. It does everything it says on the box and looks more expensive than it is. Really pleased. Had no problems at all. The only down fall i can complain about is the light, its not very bright. But if your thinking about buying a g shock this watch is very decent and it looks nice. Very happy with my purchase. Great value for money and saved by buying from watch shop. So far so good. I like the dull black look and the watch is fairly simple to work. My last casino lasted 10 years and is still going and so I have all faith in the brand. Very happy with the watch. I love the size and feel of it! Great purchase extremely happy! One downfall would be the difficulty to tell the digital time at night as the LED built in doesnt provide must coverage on that. Overall extremely impressed with the service I received from WatchShop and once again couldnt be happier with the watch! This was a present for my grandson who was thrilled with it. He soon got the hang of setting it. Has been admired by his friends, so that pleased him too. Bought as a present for my son, who specified the model he wanted. He is very pleased with it. Great watch looks good, like the recessed screen so it doesnt get scratched. I wonder how long the rubber strap will last before breaking. 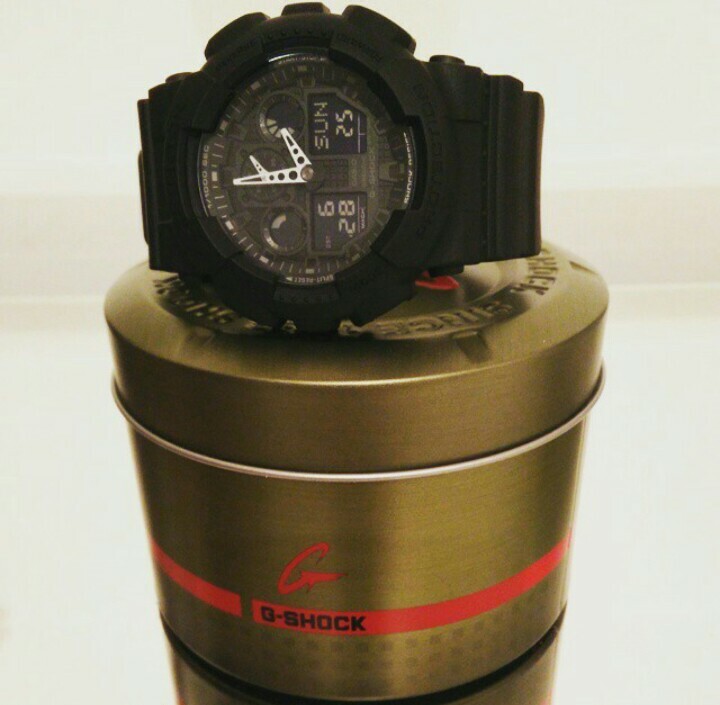 G SHOCK GA100. Good watch but can be a pain to set up. Very reliable and worth the money, definitely. I would recommend to those who are active or work in environments which would require a tough watch. Needs to be cleaned regularly as dust likes to get into the the small gaps however. Excellent watch looks great at really good price. Fits well on the wrist and watch face clear to see , light excellent feature. Great watch, havent taken it off my wrist! Surprised how light it is and how easy it is to set-up. I wanted something durable that was easy to read and this fits that perfectly. An excellent item an service from Watch Shop. 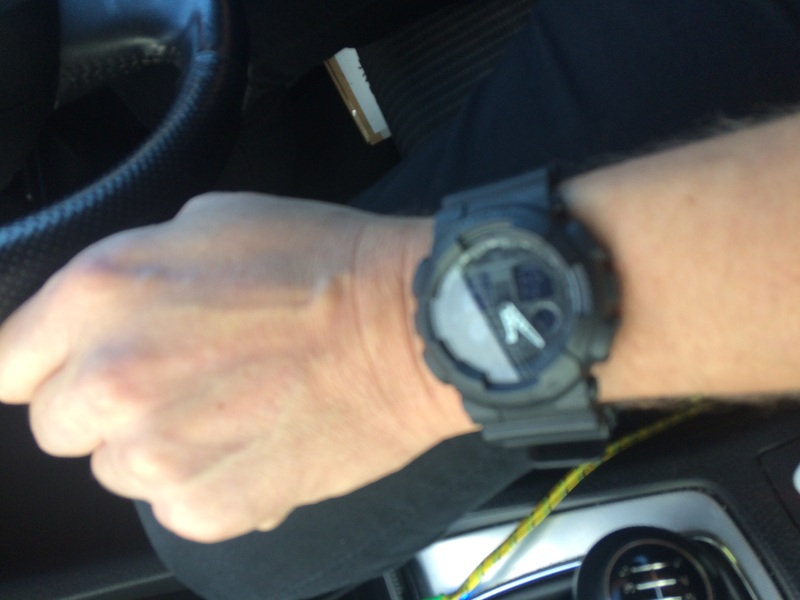 I have had G Shock watches whilst in the Army and have found them robust enough for the extreme conditions of Afghanistan and day to day rigour of Army training and exercise periods. I have taken this into civilian life and truck driving. The features of the watch are perfect for me and I love the fact that when you set the time digitally the hands move automatically unlike previous models. The delivery service from Watch Shop was second to none. At all stages from being picked to being delivered I was informed via text message. An awesome add on and kept my appetite to when I would receive my watch. Overall an excellent service which I will use again to buy family member gifts. Great quality and would definitely recommend for anyone looking for an all back casual watch. Excellent service, I even put the wrong email address and it was rectified immediately. Arrived exactly when they said it would, perfect timing for a present! Excellent service! The website was very clear about the price & delivery time! The item came at the exact time with no issues and my boyfriend loved it!!! The watch is lovely and looks exactly like the photo! The watch is great value for the price that it is sold at. It is a medium sized watch that sits nicely on the wrist. Love it! Thank you WatchShop! Excellent watch, not took it off since I have had it. Used while swimming, running and biking. While working it is perfect for anyone who is active and clumsy. Watch is absolutely excellent, Ive not had to take it off since I have had it. Comfortable, durable and doesnt look bad either. I can only say...Perfect watch!!!. After purchasing this product and saving money I was delighted with the next day service. It was fast and reliable and the watch is everything it said it was in the description. I will definitely be using your service again. The hands on the watch are easy to read and can be seen easily at a glance. The other features are far less easy to see unless in direct sunlight. A bit like the Disaster Areas space ship in Douglas Adams the hitch hike guide to the galaxy. Black dials and letters on a black background dont show easily. The light also does not enable you to see them at night unless you reflect the light off your finger placed over the dial. That said, I like the black look. Also the white hand at the top seems to serve no purpose, some blurb in the manual about measuring speed. Good luck with that. Similarly the two circular counters either side dont do much, only seem to move if you leave the stop watch going. Overall am happy with it, but will mainly only using it to tell the time. Super Fast delivery. Watch as expected and husband was very pleased with it. After searching for the perfect all round watch for years, finally I have it. The fit is comfy, the quality is there and the price was ridiculously low. The delivery was next day as well. I couldnt be happier with this watch and the overall service from the watch shop. If you are after an all round every day and evening watch this Casio is for you. Works well and looks impressive. Many many thanks. Great watch, gift for hubby, very pleased with it. Very quick delivery and well packaged. Overall very happy! Nice looking watch, feels very light on your wrist, the day and date can be difficult to read in certain lights, and the hands dont glow in the dark, which I find unusual in a watch, its very robust, and chunky, having said all that im still pleased with my purchase, as I said its a really nice looking piece, and can be worn with anything. Fantastic product at a great price with lightening fast delivery. No more needs said! It was exactly like the picture that was shown, its nice and sleek. I like that it has a batman feel to it because of the black on black hehe its subtle so my brother was very pleased with this and the fit was really good and the size complimented my brothers wrist. Overall he was very happy with his watch, he wears everytime he goes out. He loves it! The watch is a good sturdy watch and fits well on my partners wrist. He found it easy to set up and he likes the way it feels on his wrist. Fantastic watch! Big and chunky, catches the eye. Strong and robust! Lots of features including world clock, stopwatch and orange night light. Clear displays for day and night. Comfortable wearing with rubber strap. This was far exceeded the picture, it surpassed my expectation. It was bought as a gift. My hubby likes a man watch and its very beefy! Its very comfortable to wear. Excellent service from the watchshop too. Arrived they next day! Exactly as Id hoped. Fits perfectly even on my large wrists. Hands are easy to see and the illumination is good enough for my use. Easy to set up. Great watch. Good size and fits well on the wrist. Fantastic for sports and casual wear during the summer. Got this on a good deal. nice watch, bought as gift. nice features, good fit and a quality brand that should last for years. Fantastic looking watch for price paid ,perfect with black stealth face and no painted writing on it bezel also nice and chunky. Features are really good for holidays, as set up your world time and then when you get to your destination press two buttons and the times from home city to world swaps over couldnt be easier. 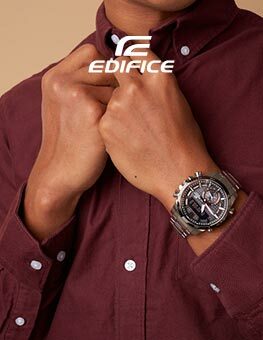 Overall good looking,water resistantw with g shock protection,good features and fantstic price what more could you want . This watch is amazing. When it first arrived I fell in love with it straight away. The all black design with the white hands make the watch look classy also its so easy to set up. The only downside I could say is that its not solar panelled so youll probably have to buy a new watch after the battery dies on this beautiful timepiece. Brought this watch as a birthday gift from my wife. 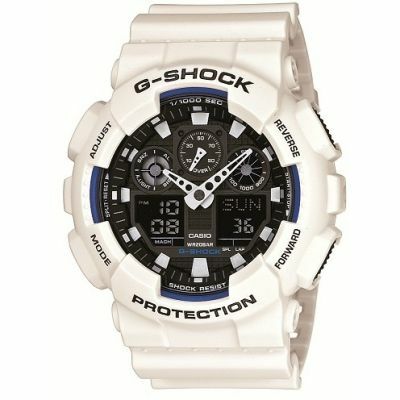 Ive admired the g shock range for sometime as I like the look of the watch and the well renound durability of the product. Ive read all the reviews on the g shock range after buying a similar g shock earlier in the year. I find that certain models are difficult to read during certain times of the day and depending on the individual watch face and colour of the hands on the watch face and in poor light and at night so doing my research payed off with this model. Ive heard people complain about the digital displays not being clear to read at low light and at night but why would you need to? Thats why this model has hands and a perfectly good back light for night reading. If you want the digital function then just buy one of the digital models. Stop watch, timer, world time, hourly bleep feature,12 or 24hour display etc what more would you want. 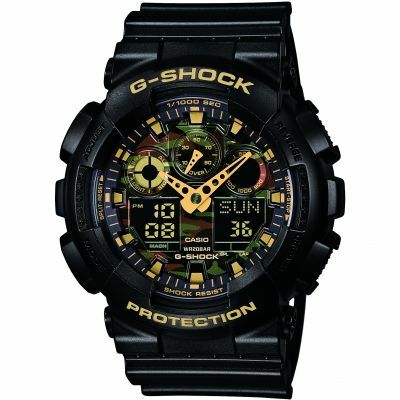 This is a great g shock at a great price, in fact I think its better than some of the more expensive versions. It is an oversized watch with quite a thick body and bulky strap but it is lightweight and comfortable and can be worn for work or pleasure. If your thinking of buying one and not had a g shock before this is an ideal model to go for with its great style, looks and all round durability. Go on you wont be disappointed. I Bought it as a replacement for one Ive lost. It does the job although the light could be more luminous. Great watch for the price. Does exactly what a G Shock should. Suits my adventurous life style. Waterproof and shock resistant. Only slight issue is the digital screens dont light up but thats to be accepted for the price. Unlike some reviews I read the back light is fine for seeing the time. Is also bright enough to light surrounding area. Fantastic watch, looks great and feels comfortable too. Has all the features you would expect. Only criticism I would make is that the black face makes it difficult to see when not in a brightly lit area and the built in light is not the greatest. Excellent product. Hardy, robust, excellent features - ideal for what it is supposed to be. Had this watch for almost two years now. I wear it about 6 out of 7 days. Been trekking, swimming and diving with it. No damage at all . Precision is good, I only had to set the time twice. Big , solid construction, not wearable under a buttoned shirt. The LED light does not light the negative display, but its not necessary . Didnt change the battery since and I have one active daily alarm for about a year now. Th strap is sturdy and resistant , also comfortable. Since I purchased this watch I have become super human, people now approach me on the streets and ask if I am related to super man. The watch is a great design, the white arms on the clock face certainly makes the difference between a rookie and a pro... 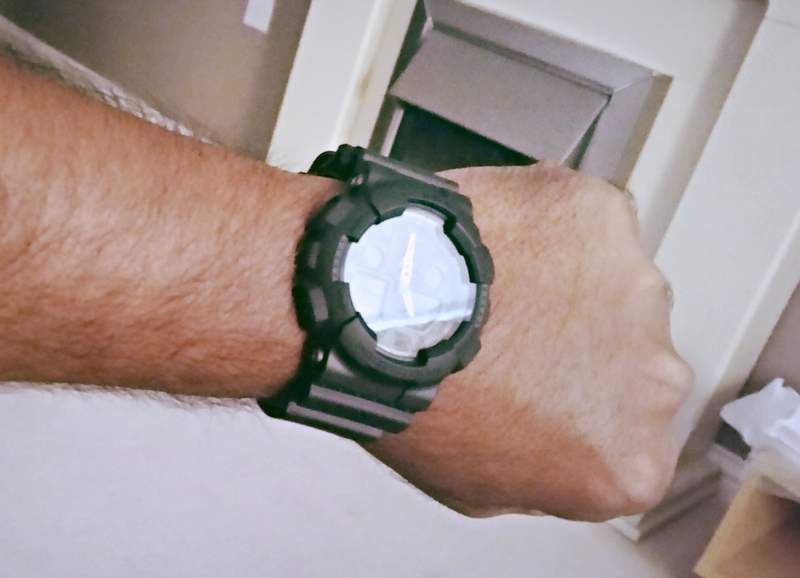 Most tactical watches have large glow in the dark arms which stand out a mile in the dark making it immediately useless. The negative screen matched with a perfectly dull red/orange backing light is a great idea and it works. 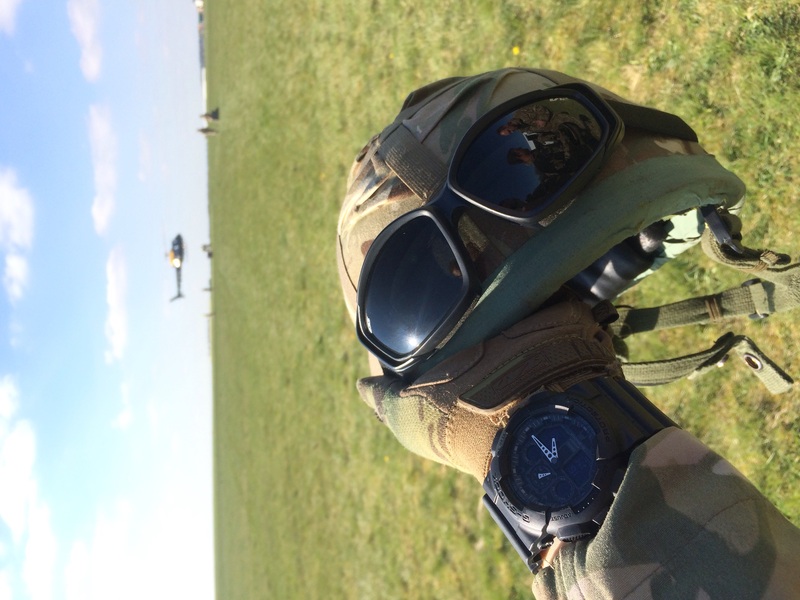 The watch is large and bulky, which is a good think, I work around Aviation and and night time ground work which means the watch can take a beating. 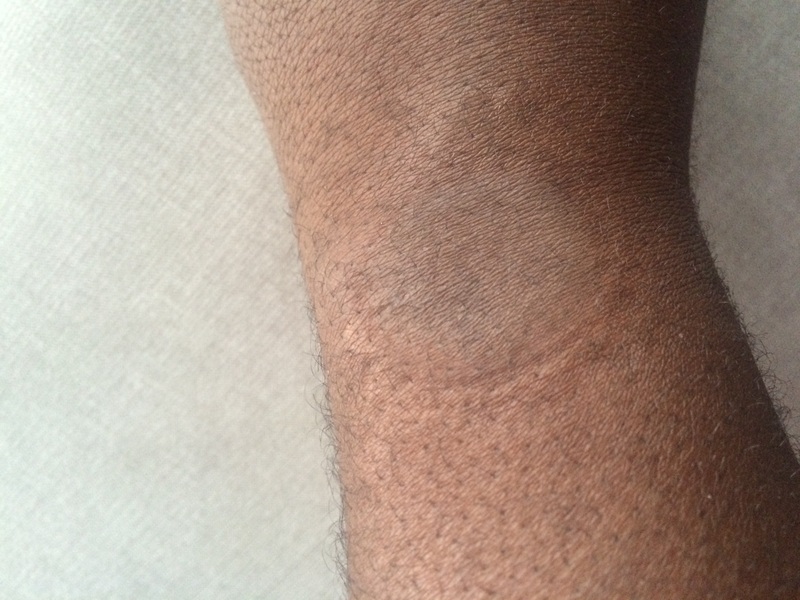 This watch passes the durability test hands down. I have already recommended this watch to many more people who are incredibly please too. Thanks watchshop for the awesome price. Nice watch which doeant feel to heavy on the wrist and has many functions as mentioned in the item description, the style of the watch is nice as the colours used go well together on the dial, only negative thing is as people have mentioned is the LCD where the date and seconds is displayed when in sunlight this may be a problem also the led light couldve put together better. Overall I recommend this product as Ive found it to be great. Looks nice and also the build quality you can tell is strong my just looking at it. I bought this along with a red G-SHOCK G-7900A-4ER. I was pleased, on opening the box, that it comes in a nice presentation tin. The face / case of this watch is really big, looks very good on the wrist. It is very robust, and well made. The materials used are high quality. It is very comfortable to wear. The strap doesnt get sweaty either! The buckle has 2 prongs on it, so it is very secure. 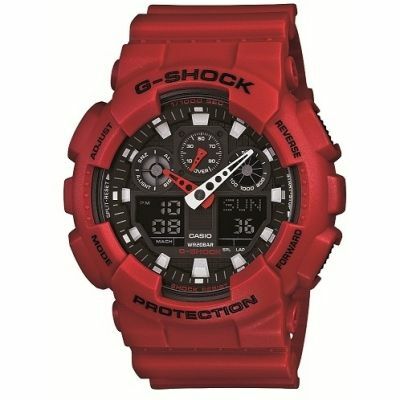 Ive bought this for work, exercising, swimming etc, and because I like G-Shocks. The price you pay for having a nice black face and LCD readouts is that they can be quite hard to read. The dial illumination is good, but doesnt light up the LCD. A picky downside is also that the watch doesnt lay flat on a table or bedside cabinet, it keeps rolling onto its side. It has a good selection of stopwatch and timer options, alarms, world time etc. Overall, it is a high quality, well made watch that feels like it will last forever. It looks very much like a watch Batman would have, in my opinion! All matt black. Its big, chunky and well made. Ive included a photo of it next to my Tag Carrera to show just how big it is. The purchase experience was very good. easy to order, next day delivery, good price. Ive only marked the watch down for it being a bit difficult to read in darker conditions. Great product and would recommend to anyone looking for a practical and reliable watch. fantastic watch. Found it a little uncomfortable for the first couple of days but soon got used to it. I thought the strap would be rubbery, but its more of a plastic. Love it to bits. Been after a gshock for a while and decided on this because of the style and look. Great features that are surprisingly useful and easy to use when you get used to them. Great watch glad I went for the gshock due to hard wearing I use at work and have been through several normal watches due to breaking! The recessed face glass means its less likely to get scratched. One of the best watches I ever had ! !, this watch has a great attention to detail. As soon as I recived the watch I instanly fell in love with it and I still do, it looks even better than in the photographs. I picked this watch over others because of the features it has for example stopwatch, alarm, countdown, world clock, shockproof, and is waterproof up to 200 feet. With its stylish look I can wear it all the time and not to worry about getting dirt on it as it can easily be washed under the tap. However the down side to this watch is that once the hands are over the l.e.d screen at the bottom you can not see anything on it however if I wanted to know the date. A other problem I have noticed with this watch is the hands dont seem to be compleatly accurate with the time but thats hardly a problem as its not that noticeable. 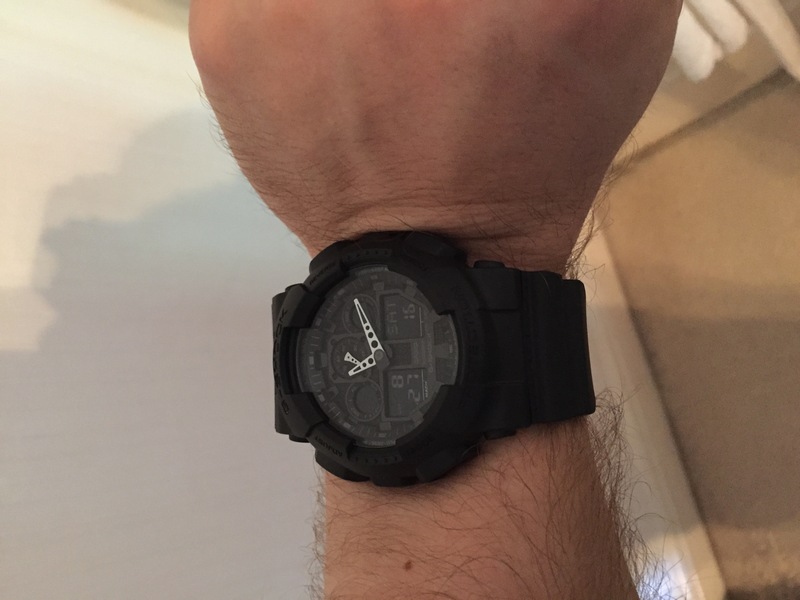 I would always recommend this watch the black G shock chron watch to anyone as I think itd one of the best watches money can buy and will last yoi for years ! The service was great and came quicker than expected, would definitely shop with Watch Shop again. Product was also exactly what I expected. exactly how it was pictured and described on the website! Couldnt be more happier with the product and the service provided by the watch shop. Really pleased with this purchase. Not the most expensive but good value for money, looks durable and tough. Styling is great and wouldnt look out of place at work or socialising. Well worth a look. Absolutely excellent watch that has surpassed all my estimations. The quality of the finish is outstanding and all the features this watch offers make it incredibly versatile and perfect for any task you throw at it. Good Watch, feels good , does the job. Does look like in the pictures provided. Excellent quality watch. Lots of information. Fast delivery. Best price guaranteed. Unfortunately I managed to get the watch that was faulty boo hoo. Eventually after returning the faulty watch I got a replacement. Usually I wear a Seiko diving watch but its heavy and expensive to wear swimming with the kids. 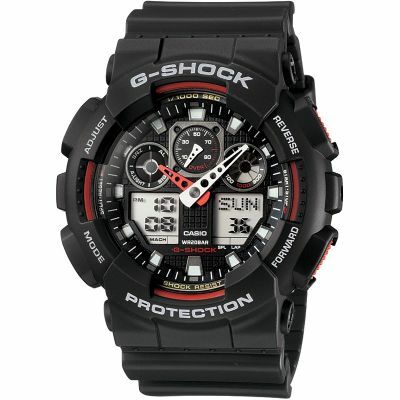 This Casio G-Shock watch is superbly lightweight and looks great for a reasonable price. Its just your luck sometimes that you get a faulty one. However I cant fault Watchshop as they replaced the faulty watch promptly with their no hassle free postage procedure. Nice watch. I needed a new one the goats ate my old one. This one is a little more robust and it will take a little longer for the goats to chew through the strap. Excellent, well built watch. I was looking for something that could withstand all weathers and conditions out on the fells, and also look good down the pub. I wasnt disappointed, and I dont think you will be. Its a bit on the chunky side, but thats a bonus for me, as I break watches easily, but I dont think that will happen any time soon with this one. Great looking, stealth style watch. Perfect for my training needs both in and out of water, mud, all types of terrain. Looks great on as daily watch too, and often commented on by others. Excellent value for money. Only improvement would be louder alarm. Bought this item to give as a gift for my partner as he finds with other watches hes had that they always end up scratched and dented just through everyday wear. Its a really great watch thats pretty sturdy but also looks really good - the all black stealth design makes it look more expensive than it is! The watch looks great and feels great. Stylish, sporty and practical. The all black look gives a stealthy looking effect for a great price. The watch feels very sturdy and I am very confident wearing it on a day to day basis I work in a steel works. Only downside is it can be slightly confusing trying to learn all the different features of the watch however once you have done them a couple of times it become very easy. 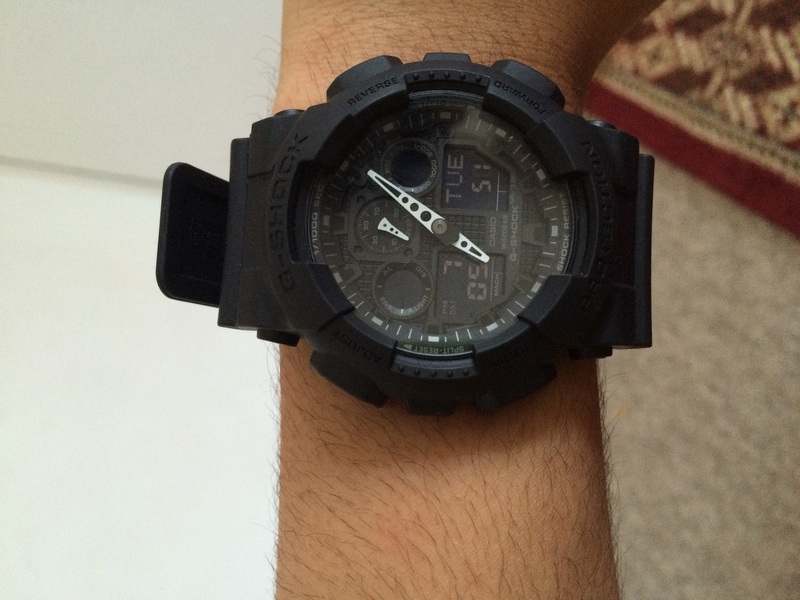 I bought this watch for my boyfriends birthday as he wanted a matte black G-Shock. Its a really nice watch, and really easy to use we learnt how to use the settings via youtube. Its a big watch on me but on him 6ft2 it looks chunky. Like all G-Shocks, the quality feels good and durable. I would say it feels more durable compared to the resin counterparts. The gift wrapping was lovely, so thank you watchshop! The only thing I would say is that the lume isnt as bright as he would have liked. Despite this, I would still probably buy one for myself as its such a sleek watch. 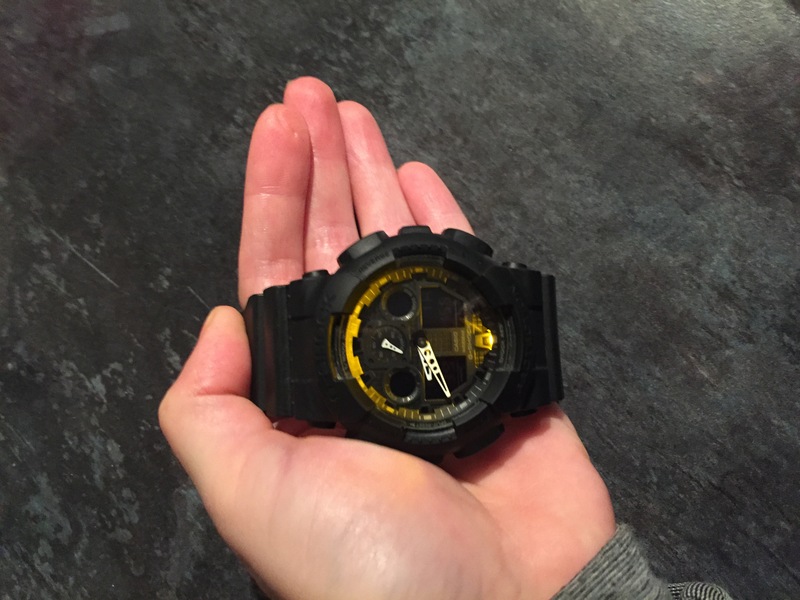 Good watch all round - decent size face but not too massive - I purchased diff coloured strap to personalise it more - overall very happy, also as I paid £73 rather than the £110 option I tried on in the G Shock shop in Covent Gdn. Recieved watch next day, bought mainly for work and leisure which suits perfect. Love the look of the watch, the diferent modes are really good, light is good for analogue display. Only snag is its a couple of mm to big at first, i am now used to this. Really good watch. 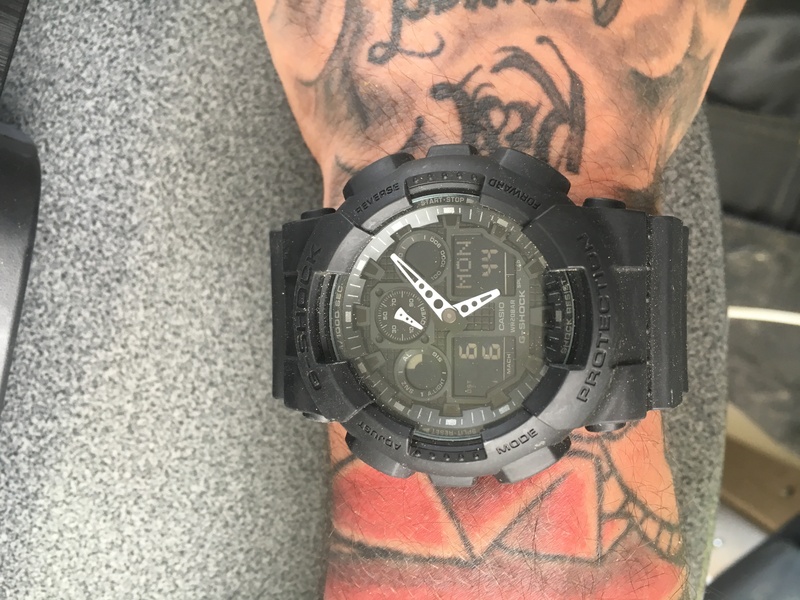 Bought this G-Shock to replace a 10 year old G-shock which had seen better days. Great watch, set the digital time, analogue hands set themselves automatically. Strong strap with double pins. Slightly larger face than the watch it replaced. Stylish watch which can be worn at work or socially. I bought this watch purely because I had owned g-shocks before and they are the only watches I dont break! I like the look of this all black model so purchased it whilst it was discounted in the sale. When it arrived I was pleased to find the item well packaged. It comes in s stylish metal tin with a booklet of operating instructions. I use a watch simply for telling the time but this item is capable of so much more. I almost feel guilty wearing it and not making full use of its functions! A great buy and is definitely recommend. I bought this watch few months ago from watch shop for a trip to France to visit my cousin. He saw the watch n fell in love with it so i gave it to him on my return to England and just last week i bought another one. The design and colour of this watch is great and will look great on any man love to a great watch for everyday use with great value. I will recommend this watch to friends n family. Great looking item, nice and chunky and unusual. I purchased this as a casual watch as have others I wear with a suit. Its lightweight but feels like it would survive an attack from a shark or if a small light goods vehicle crashed into me. The light is good for the hands, not so much the LCD display but not really an issue. Overall very impressed especially for the money. Great value. As a serving officer in a particular service, I needed a tough rugged and reliable watch. This g shock in particular certainly ticks those three boxes for me. Subdued lettering and a robust facia is perfect for the job. Whilst automatic time setting is great, just set your location in the world and the watch does the rest. An allround quality watch for the money, in my view. However the only downside for me is the back light. It would be better if casio could improve the bulb location and maybe give users a choice of a couple standard colours. Apart from that, a perfect purchase..
Great watch - very stealth looking - if Batman had a watch it would be this! very lightweight, strap nice and comfy, looks the part. The watch is exactly what it looks like on the website! I was extreenly impressed with the item I had bought! I love everything about the watch! I bought this for an 18th birthday present, and I couldnt be any happier! Theres nothing I dont like about this watch! One of the best mens watches Ive ever seen! I LOVE the fact its matte black with an all black face and strap too! The style of the watch stand out as its face is large and prominent, but thats what I love! I wouldnt hesitate on buying the g-shock! Defiantly worth every single penny!! this product is AMAZING by far the best watch ive ever had and will keep recommending it to everyone it has so much features and is well worth the money it is a must bye. made up with this watch,lightweight,very simple to use and tough! Perfect when at work to save damaging my bell and Ross watch! 100% recommend this watch ! Needed a casual watch which I could wear all the time without fearing of damaging it. This ticked all the boxes. Cheap, tough, light, water resistant & looks great. The only comment is the LED light which doesnt really light the face enough. I brought this watch as a gift and was really happy whe I recieved it as it matches the picture very well. Its all black and easily adjustable. The recipient of the gift was also very pleased with it and soon found how to change the time/date without use of the manual. Altho, more can be found out from the manual also. The only comment I would make is that the light isnt very effective, it shines from the bottom making the top still difficult to see in limited light. This is a fantastic watch. I gave nothing bad to say about it! It goes well on my wrist and looks great. It has great functions and is a fantastic overall watch. Fantastic looking watch, lovely backlight that enahces the appearance of the watch. Enough fearues to keep you busy, all easy to use after a quick flick through the guide. Item looks exactly as shown. Works efficiently and looks great. 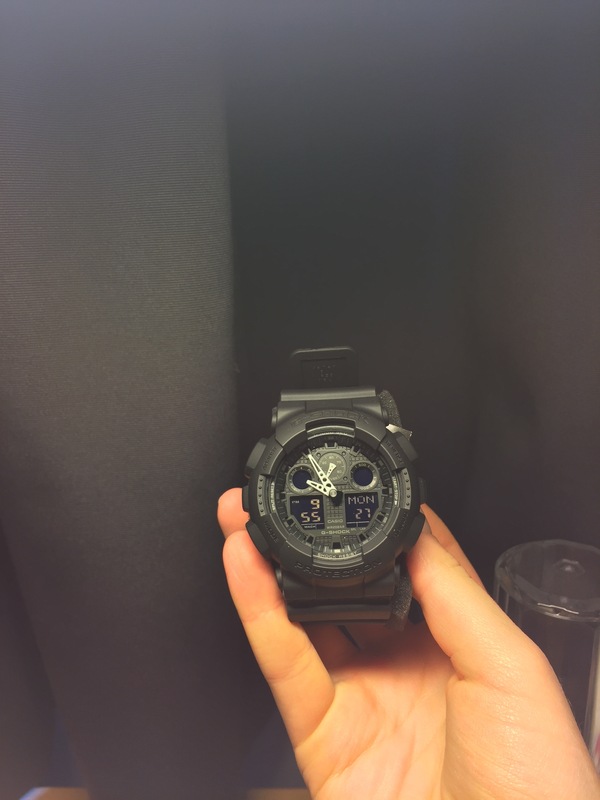 Does have the G-shock light which is not obvious on the image. Brought this for my son, he absolutely loves it. Really nice looking watch with a large face. Order for style so not sure how all the functions work, but good instructions included. Would definitely recommend this watch, really good quality and reasonable price. 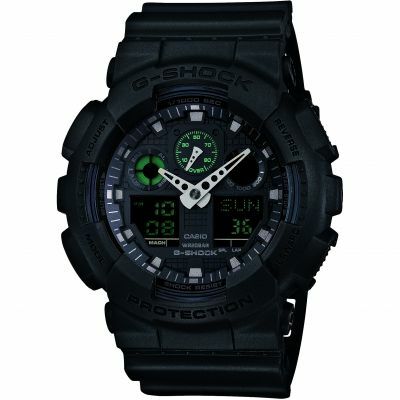 I have always really liked g-shock watches and this one appealed to me as it is all black. This makes it immediately stylish and very easy to wear. It has all the features you would expect with a g-shock, I especially like the wrist tilt light up feature. If youre not into the endless list of g-shock features and just want something that looks great, then this is the one for you! I got this as a gift. It was great value for money, arrived quickly and managed to make my very fussy boyfriend happy! Only thing is being all black the display is quite dark so you do need to the light each time to see the time. Fantastic service the watch was a gift which the person. Loved it. Excellent next day service and gift wrapped. 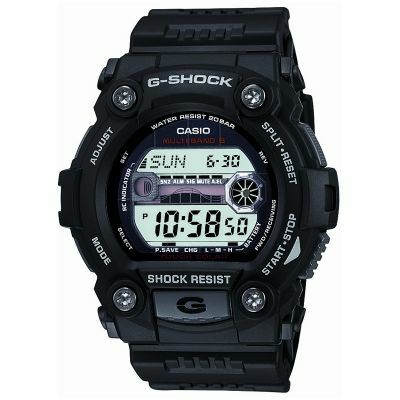 Amazing casio g shock watch in black with digital and analog display quick and easy to use stop watch. Great product 110% recommendation. looks good, son choose it as a xmas present, so not had it going yet, but he did look around at others before picking this one. it came fast and well wrapped. Lovely watch, exactly what I ordered. The gift wrap made a lovely touch to the item. Top watch wonderfully understated but does everything you need. Spot on, love it! Excellent purchase! Bought this as an early Christmas treat for myself. 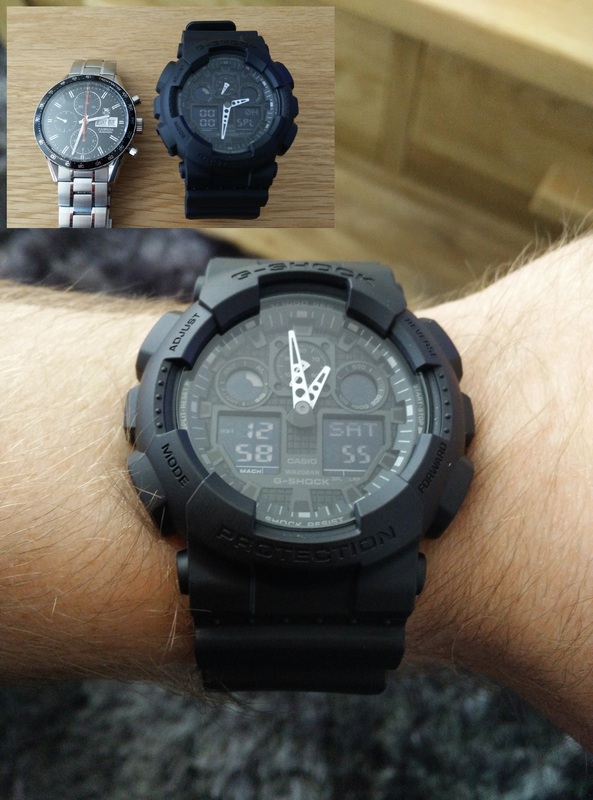 After looking at many watches around the £100 mark, my eyes were drawn back every time to the G-Shock GA-100-1A1ER. It is a stunning looking watch. 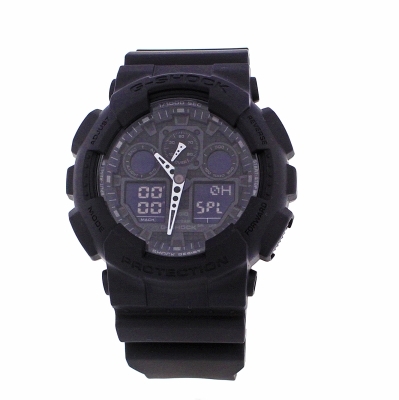 The watch is stealth black with a dark grey decal and white hands. There is also a digital display showing the time/date day and seconds. The watch with its large, rugged, military styling feels solid while being comfortable to wear and sits well on the wrist and can be worn with confidence as this watch will cope with anything thats thrown at it! Ive worn this watch with various clothing, sportswear, jeans and t-shirt and a suit and this watch suited every occasion. I have no negative comments, and can highly recommend this product. The watch was an absolute bargain at £73 as it was priced considerably more elsewhere. I cant finish this review without giving a mention to The Watch Shop, which i was highly impressed with their overall service, from the excellent website and ease of use to the speedy and dependable delivery. An excellent product and a great service. Well Done!! I love this watch. I own quite a few expensive watches that are constantly getting damaged. I wanted something for day to day use. This watch is great. Its chunky, durable and looks cool. It is a lot lighter than it looks.